The other day a bobcat decided to bless my parents with his pressence in their backyard. They have lived in the same house for 45 years and never in all those years has this ever happened. 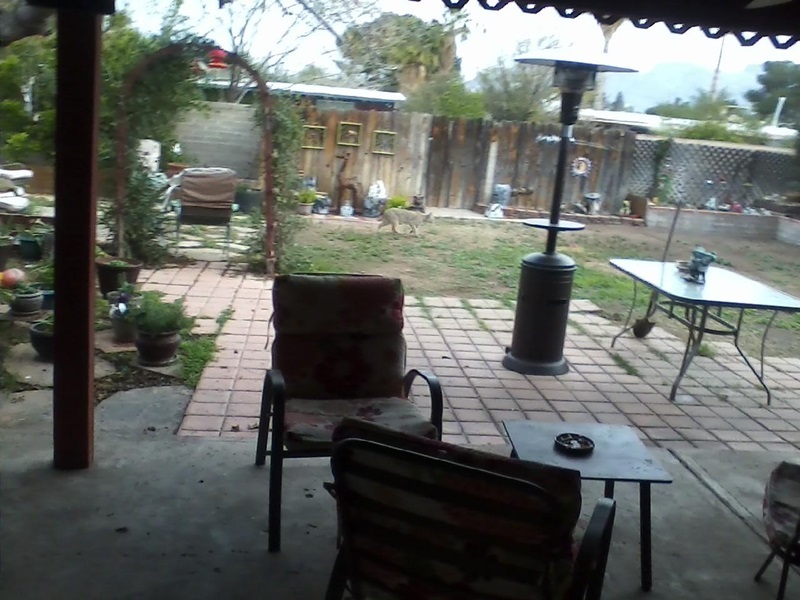 My dad grabbed his cell phone and took a few pictures as the bobcat walked across the yard, got into the flower bed and then hopped the wall. I unfortunately was not there at the time, but I still wonder what the message is that the bobcat is bringing to me and my family. I just find it interesting that after 44 years having never seen this type of thing, I have one cross my path 4 feet in front of me and then one hops the wall into my parents backyard. I did some research after I first saw the Bobcat on my walk about what the Bobcat means spirutally and now after hearing of this experience from my parents I am going back and checking into more. Here are a few things I learned about Bobcat Spirit Animals. The Bobcat is a sign of patience. They incorporate stealth, strategy and patience when hunting. The message is clear, we must be willing and able to plan, adapt and have the patience to see what we want become reality. The Bobcat also lets us know that we must be fully aware, as he is especially when hunting. Seeing him sends a message to be mindful and to be sure to show our respect, love and consideration to others. Since the Bobcat is a solitary creature seeing him could also indicate that it is time to step back from some people in our lives. The Bobcat reminds us to embrace the alone time. There are other symbolic meanings for the Bobcat like, playfulness, intellect, and cunning. Seeing the Bobcat could remind us to be more playful, open up to creativity, think outside the box, embrace your innermost desires and open the door to your potential. I am not sure what the bobcat means for my parents but I have a pretty good idea. I have certainly realized what it meant to me when it crossed my path. I did wonder if the Bobcat I saw was the same one that ventured to my parents house. I did see it in the same general area as my parents house so I suppose it is not out of the question. Of course we will never truly know the answer but we certainly had a couple of really great experiences.